Want to go for the most obscure James Bond car? It isn't the Toyota 2000GT that they specially turned into a convertible so Sean Connery could fit. But it is a car that, deep down, I know everyone likes. The Saab 900 Turbo was never actually in a Bond film, but 007's car in the John Gardner James Bond novels starting with License Renewed. A Saab sounds like a strange choice from a man you picture to drive an Aston Martin DB5. It's sort of on the Lotus Esprit-side of eccentricity. But unlike an Aston or even a Lotus, a Saab isn't going to attract unwanted attention. Exactly what a spy needs. Eventually dubbed "The Silver Beast," CommanderBond.net says the Saab coveted by the '80s yuppie was considered to be the necessary upgrade Bond needed in the novels to transform the character into something more modern. The timing was kind of perfect, since the 900 Turbo was launched in late 1978 and Gardner was just about to start writing License Renewed. 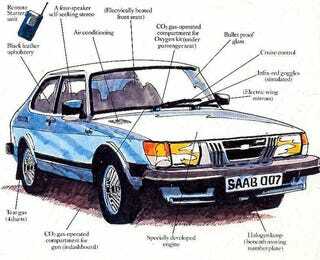 Gardner went about fitting the Saab with really useful gadgets befitting of a Bond vehicle, from this list at JamesBondLifestyle.com. So aside from the practical features of the stock 900 Turbo that included heated seats and power mirrors, the Silver Beast boasted a remote starter, bulletproof glass and tear gas that would come out of the back of the car. Oh, and its stock 2.0-liter four-cylinder had more turbo boost that brought top speed up to 170 MPH. Aston, what now? Saab went so far as to building a living, breathing example of The Silver Beast. And it's all there, with bits and pieces from the Saab law enforcement package, run-flat tires way before any sports car had them, a head-up display (born from jets, for real this time) and the engine boosted to 240 horsepower. Let's not think about the epic turbo lag and torque steer that would come from that power and this front-wheel drive chassis. The end result is not a professor's car, but a stealthy machine that would sneak up on villains and overtake them with its epic amount of boost. I just love the idea of it. I'm probably blinded by my Saab love, but this is the Bond car that got away. Were it not for weird product placement deals with other carmakers, 007 would definitely have driven The Silver Beast on the Silver Screen. It's less jarring to imagine seeing Moore, Dalton, Brosnan or Craig driving something comparatively plebeian as a Saab when you remember the first three Brosnan films were sponsored by BMW, which provided the Z3 1.9 and 750iL. Boooooring. And as we know, Saabs are driven by cool people like journalists. I don't know, I think Roger Moore should've driven this if they could have figured out how to make it into a submarine.